Simon Morrison has conducted archival research in St. Petersburg, Stockholm, Paris, London, New York, Washington DC, Copenhagen, and (most extensively) in Moscow. Recently he has traveled to Tel Aviv, Beijing, Hong Kong, Montreal, Moscow, Copenhagen, and Bangkok to give invited lectures and graduate seminars. Morrison's latest book is a comprehensive, archival history OF THE BOLSHOI BALLET PUBLISHED BY LIVERIGHT, the prestigious and storied imprint of W.W. Norton. Future books include studies of Shostakovich and Tchaikovsky, again based on new archival sources. 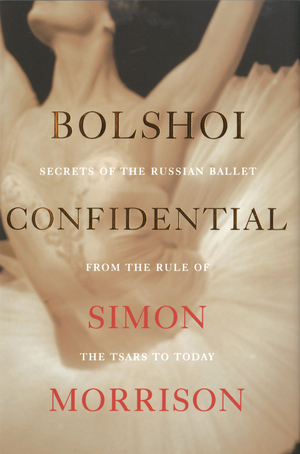 Bolshoi Confidential is a “Booklist Editors’ Choice” for 2016. Several books and articles including Russian Opera and the Symbolist Movement (California, 2002) and The People’s Artist: Prokofiev’s Soviet Years (Oxford, 2009) as well as editor of Prokofiev and His World (Princeton, 2008) and, with Klara Moricz, Funeral Games: In Honor of Arthur Vincent Lourié (Oxford, 2014). Shortlisted for the 2017 Pushkin Prize. Learn more. Conductors, choreographers, performers, and publishers of scores and scenarios for dances once lost to both historians and artists alike. Both Music for Athletes, by Serge Prokofiev and the original ending to Prokofiev's famed Romeo and Juliet were brought to life thanks to Simon's careful archival research, and collaboration with institutions such as Princeton University and Mark Morris Dance Group. Morrison writes for a wide public, including readers of The New York Times, New York Review of Books, Threepenny Review, London Review of Books, and Times Literary Supplement. He serveD as president of the Prokofiev Foundation, and edited the journal Three Oranges, produced under its auspices. New York Times: "Artists Across US Take to Stage to Protest Trump Policies"
Town Topics: "Princeton University Performs Ballet With Rarely Heard Cole Porter Score"
Two years ago, Princeton University music professor Simon Morrison was working on an article in the archives of Yale University when he noticed the original score for a ballet by none other than Cole Porter. Within the Quota, which had libretto, scenery, and costumes by wealthy expatriate artist Gerald Murphy, premiered in Paris in 1923 and was Porter’s only commission for a ballet. The event will be followed by a reception. In collaboration with the London-based ensemble Penguin Cafe, Princeton University has reimagined Within The Quota, a pantomime-ballet from 1923. Within The Quota, with a score by Cole Porter, responded to restrictive immigration quotas based on national origin that were enacted in 1921.
shortlisted for the Pushkin Prize 2017. Click here to learn more about the award.